Radium is a naturally-occurring element found in miniscule amounts in soil and water posing no health risk. Its risk comes from ingesting the element regularly, such as in industrial settings. The City of Alameda became the new owner of the Seaplane Lagoon at Alameda Point on April 13, 2016. It came from the Navy with a new condition that exceeds normal protocols for dredging in San Francisco Bay. As with all cleanup sites, the Navy, city and regulators agreed to what areas needed to be cleaned up in the Seaplane Lagoon. The cleanup plan approved in 2006 was based on testing the sediment throughout the 110-acre lagoon. The problem areas were confined to about 10 acres at the northeast and northwest corners of the lagoon where storm sewers dumped contaminants prior to 1970s environmental laws. The agreed upon plan said that there would be no restrictions on the lagoon when cleanup was done. Dredging the northwest corner of the Seaplane Lagoon in February 2012. Looking east on West Tower Avenue. Buildings 5 and 400 are where radium-226 paint was applied to aircraft dials and markers. Paint waste contaminated thousands of feet of drain lines, most of which have been removed. 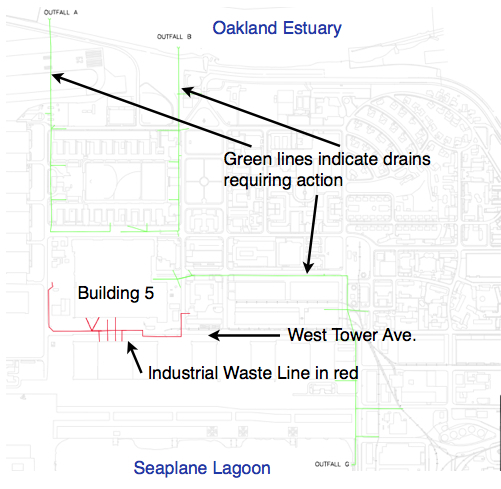 The remaining radium-contaminated Industrial Waste Line is partially illustrated showing where it runs in front of Building 5, also known as the Naval Air Rework Facility. 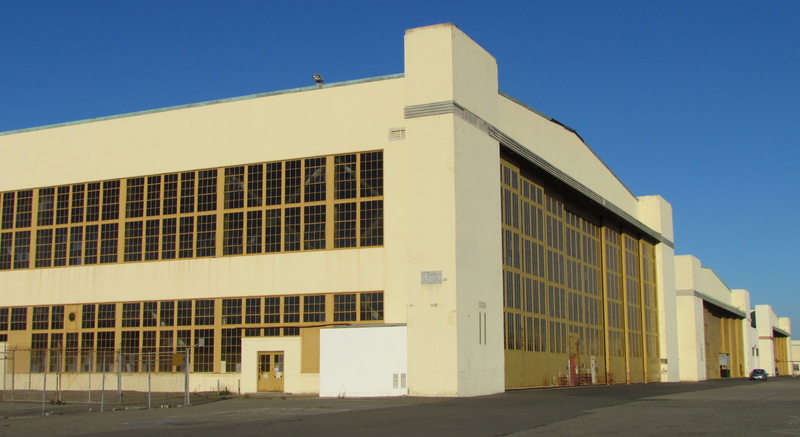 All of the drain lines containing radium-226 paint waste at Alameda Point have either been removed, cleaned, or are scheduled to be cleaned or removed, except for one: The Industrial Waste Line in the hangar area where aircraft dials were painted. This drain line was installed in the mid-1970s after passage of the Clean Water Act prohibited sending industrial waste into public waterways. It sent wastewater to a treatment facility, and is now lying dormant, broken in places, and no longer in use. The big question is what to do about it – leave it alone and create a special radiological license, a special exemption, or dig it up? The Navy, regulatory agencies, and the city discussed this cleanup problem at their regular cleanup team meeting on June 11, 2013, the most recent date for which meeting minutes are available. 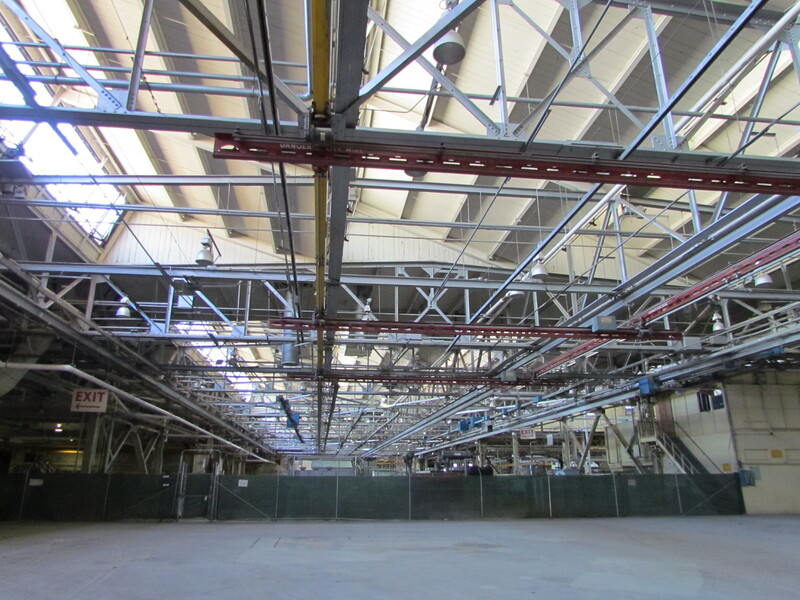 Clean area inside Building 5 where Navy aircraft were serviced. Radium painting occurred to the left and outside of this area. Even though radium dial painting at Building 5 and Building 400 along West Tower Avenue had ended by the time the Industrial Waste Line was installed, drain lines inside and under these two buildings contained radium that may have been released down into the waste line. The regulatory agencies aren’t sure how they will sign off on this waste line if it is left in place with elevated radium-226 levels inside the pipe or possibly in the soil where the pipe has deteriorated and leaked. The city doesn’t want a perpetual worry about monitoring and digging precautions. The East Bay Municipal Utility District (EBMUD) would also be concerned about the presence of radium. The Navy’s Environmental Coordinator, Derek Robinson, asked the city’s engineering contractor, Angelo Obertello, if EBMUD was asked about routing around the existing industrial waste lines. Mr. Obertello said EBMUD is looking to upsize the lines in this corridor because of fire flow pressures. The city’s Chief Operating Officer for Alameda Point, Jennifer Ott, said that sewer and storm drain lines are planned for this area and that it is not realistic to expect EBMUD to work around existing rad-impacted lines. The Navy is hoping to avoid the extra cleanup expense by asking the state to write a special document governing the drain line – essentially a warning label on a half-mile of two streets. The Navy asked the city if they could work around the lines when installing new infrastructure. But even though the city’s new infrastructure plans call for using concrete utility corridors, or trenches, the plans drawn up by the city’s consulting engineer, Angelo Obertello, show that there would be future utility conflicts with the half-mile of the Industrial Waste Line on West Tower Avenue and Lexington Street. The Industrial Waste Line, including its connections to Buildings 5 and 400, is about a mile in length. Right now, the idea of writing a special radiological license or granting a special exemption is an administrative headache because not enough soil samples have been taken from around the waste line to fashion such a document. Rob Terry of the U.S. Environmental Protection Agency pointed out that the whole licensing issue would go away if the drain line were removed. 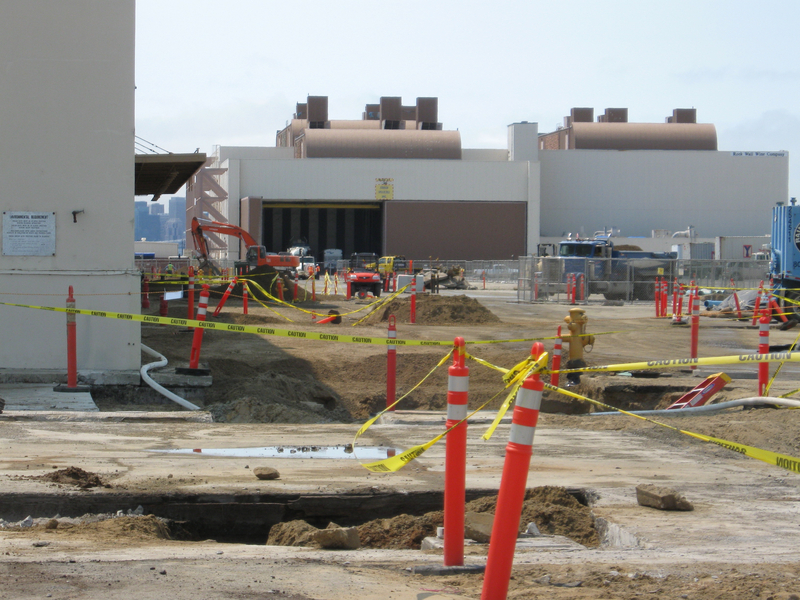 A similar drain line at Hunter’s Point Shipyard in San Francisco was removed. 2009 removal of radium-226-contaminated storm drains next to Building 400. West Tower Avenue is to the right. Looking west. The meeting ended with everyone agreeing to continue working together to solve the problem of what to do about the radium-impacted Industrial Waste Line and adjacent soil. The minutes of the Industrial Waste Line agenda item at the June 11, 2013 cleanup team meeting are below. “Mr. Robinson said the Navy appreciated the City’s effort in preparing drawings of the industrial waste lines. Peter Russell (City) said the drawings show potential conflicts with infrastructure/utilities (existing and future) and thus are higher priority for addressing. “Angelo Obertello (CBG), City contractor, explained that updated figures were prepared and overlain on as-built drawings of existing utilities. Areas were identified where existing utilities fall within the industrial waste line areas. The City has also re-evaluated placement of future utility lines in West Tower Avenue, Lexington Street, and Monarch Street, and preliminarily shifted the future lines about 15 feet away from the existing industrial waste lines. 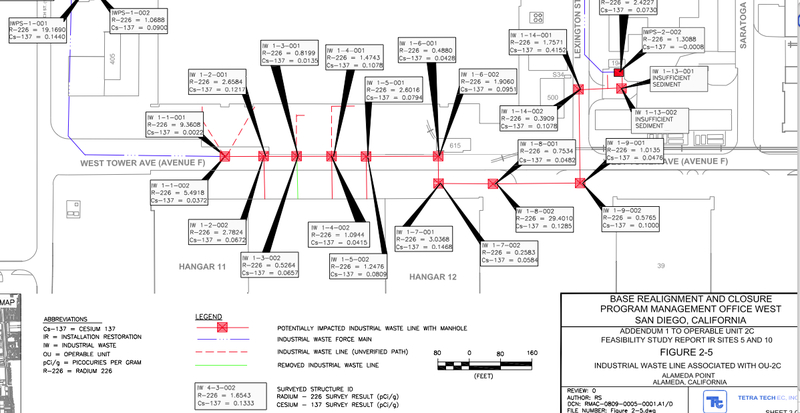 Based on the drawings presented, possible conflicts could occur along approximately 3,300 linear feet of line as follows: about 900 linear feet of 4-inch force main; and about 2,400 linear feet of gravity line feeding into the pump station in Lexington Street. This represents about 57 percent of the force main line in conflict with existing industrial waste lines and about 44 percent of the gravity line in conflict with existing industrial waste lines. The conflicts primarily in West Tower Avenue and Lexington Street are for future utilities and represent about 45 percent of the lines. “Dr. Russell noted that as part of the petroleum program the Navy identified former fuel lines in Monarch Street, close to the industrial waste lines. Sampling of the fuel lines was interrupted and sampling locations were adjusted to avoid the industrial waste lines. “Mr. Robinson asked if the City expects to put buildings on top of any the industrial waste lines. Mr. Obertello said a 300- to 400-foot area northeast of Building 12 contains industrial waste lines and potentially falls within a future development block. Jennifer Ott (City) said the area may be residential and is identified for intensified development to support the historic district. Dr. Russell noted this land would not be acquired until about 2019. “Karen Toth (DTSC) said DTSC has discussed this with CDPH licensing staff. Until it is known what is left behind in the soil, CDPH cannot say whether a radiological (rad) license or license exemption is appropriate. Soil data are needed on what remains. “Marvin Norman (Navy Legal) said the consensus is that the rad-impacted lines beneath the building slabs will remain in place and the question concerns the extent to which the Navy commits to removal of outlying lines. He acknowledged the issues of licensing will need to be dealt with regardless of which option the Navy pursues. “Mr. Robinson asked if CDPH will work with the Navy in making its determinations. Ms. Toth said CDPH is available for further consultation. This is a new process for CDPH at a CERCLA facility, and the first rad license exemption will be for HPS. Bob Carr (EPA) said there have been discussions with CDPH and no decisions have been made yet. EPA asked for specifics and could not get them. “Rob Terry (EPA) said he has some experience writing rad licenses and the more contamination, the harder it is to exempt a property and the more complex the license becomes. He envisioned an AP radioactive materials license and individual “storage and use areas” within the license. Ms. Toth said they are looking at the larger buildings and lines coming out of the buildings; there are two (or maybe three) areas still under evaluation. “Bill McGinnis (Navy) asked what legal criteria/standards/requirements CDPH is using and where the process is now. Ms. Toth said the decision criteria are still up in the air. In talking with the CDPH Radiological Health Branch (RHB), they are looking at data from specific waste lines and more site-specific data are needed in those areas being left in place. 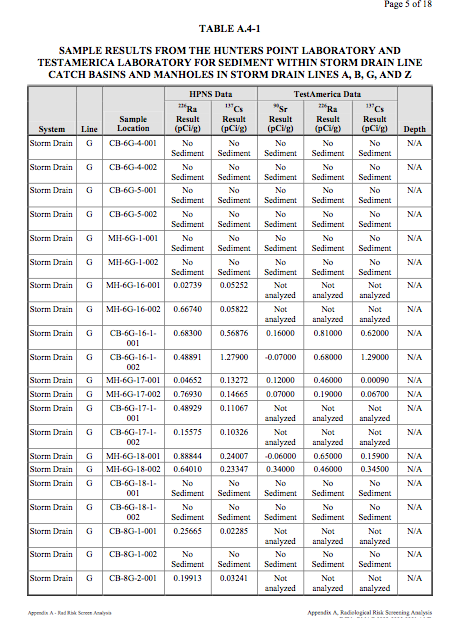 CDPH/RHB is not making “impacted” v. “non-impacted” decisions for industrial waste lines. Ryan Miya (DTSC) explained the process for licensing/licensing exemption at HPS. RHB needs to understand what is being left in the ground to determine whether or not an exemption is appropriate. The activities remaining and boundaries in picocuries per gram (pCi/g) should be defined. 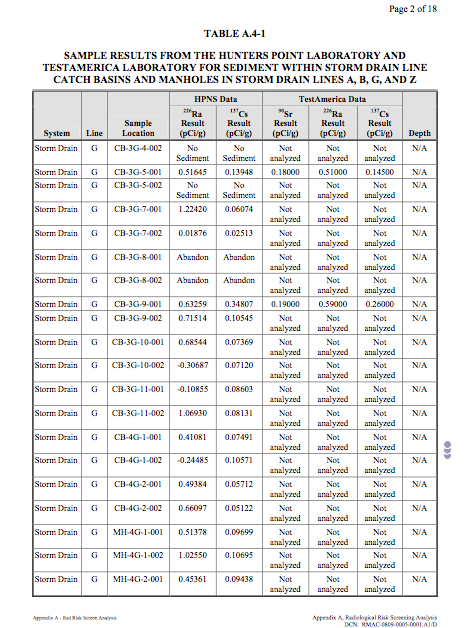 “The Navy drafted a “dose-modeling assessment” for HPS so RHB understood what it is issuing a license or exemption for. The Navy and DTSC worked together to prepare the assessment, which became a key component of the application. The assessment determined how much rad is left and how deep it is located. The City of San Francisco will file an application with a cover letter, the dose-modeling assessment, and supporting CERCLA documentation in about one month to CDPH/RHB. At HPS, a small landfill/debris area is what remains. “If AP is proposing a buffer area for a utility corridor, then more information is needed for that buffer determination. Dr. Russell said it seems easier for CDPH to issue an exemption for buildings with concrete slabs in place, and wondered if an issue is being created by addressing lines under buildings together with lines in the streets. Mr. Miya said yes, lines under the buildings are much less likely to offer potential exposure, while the lines in the streets offer a more likely exposure pathway. “Mr. Terry agreed with Mr. Miya’s description of the process, and said CDPH is looking at two issues: the rad dose remaining in place, and the quantity of rad materials present. The possibility of a rad license for AP is a very real one, and under CERCLA the cleanup should be as complete as possible. If everything is removed, the need for licensing goes away. “Mr. Robinson said that the Navy modeled the industrial waste line exposure scenario very conservatively. The Navy is concerned about the uncertainty of a license versus an exemption. Mr. Miya said that knowing the potential exposure of what is left behind is important; at HPS what is left is very low in concentration and is covered by three feet of soil. “Mr. Robinson asked if DTSC’s main concern is the uncertainty of a license exemption. Ms. Toth said DTSC’s main concern is that if an emergency arises – e.g., a sinkhole occurs in the affected streets by a water or sewer line break – this could require hiring a rad contractor to address a sinkhole or line break, either by the City or by East Bay Municipal Utility District (EBMUD). “Mr. Norman asked if it would be considered a problem if the lines were grouted and sealed. Ms. Toth said the clay (gravity) pipelines are known to have integrity problems. The implementability of the remedy becomes a problem. “Bob Carr (EPA) said what Ms. Toth described is a very real possibility, and the reality is that a break in the pipeline requires time-critical access to the area to repair. Mr. Norman asked for clarification about whether a sinkhole would be caused by the natural geology or the possibility of breaking lines. “Mr. McGinnis said the CERCLA Institutional Controls (ICs) and Land Use Control-Remedial Design would state that repair work is subject to a soil management plan including rad control requirements. Ms. Toth said the City and EBMUD do not have the ability to comply with this in a timely manner. Mr. Robinson said the Navy appreciates Ms. Toth’s concerns. “David Elias (Water Board) said that in early discussions with John West (Water Board), the project as envisioned indicated that the rad material was well defined, the risk was conservatively assessed, the lines left in the street would not be in contact with anyone, and the lines would be under concrete. However, with redevelopment the current scenario changed and the situation is different, creating small “waste management units.” With future changes it may become hard to address these issues. There is no real precedent for this approach. He said the agencies may become less comfortable with the new scenario. Mr. Robinson said it is difficult for the Navy to do things just for future development; however, the City needs to take into account the environmental disposition of the property. He suggested evaluating some options for relocating lines. “A lot of good information was presented today and the Navy will look more closely at the drawings presented. “Dr. Russell said even without the City’s redevelopment, when the Navy built AP the design standards were different and construction had shorter life cycles. Regardless of future development, the current infrastructure must be repaired and maintained for several years. Mr. Robinson said the Navy appreciates this, and justifying cleanup expenditures is tied to risk. The waste lines have been evaluated in a Remedial Investigation/Feasibility Study; the risk was determined to be low and within the risk management range. It is difficult for the Navy to consider complete removal of the lines when risk has been shown to be low. “John Chesnutt (EPA) asked if there is a risk driver and what would make the agency members comfortable with the certainty of the risk. 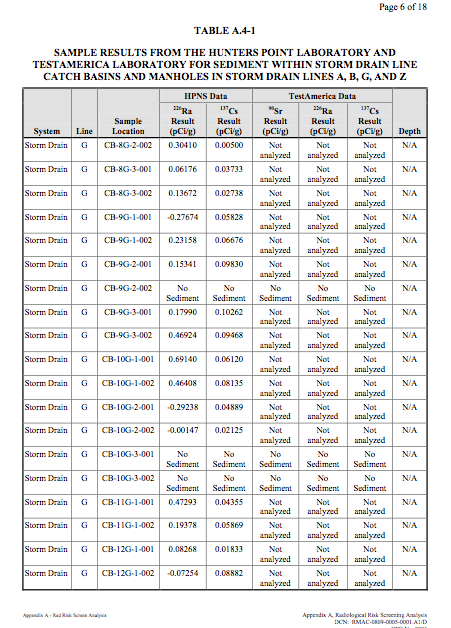 At HPS, after removing 20-plus miles of pipelines, breaks were found and sampling showed rad levels in catch basins were similar to intact pipeline areas. 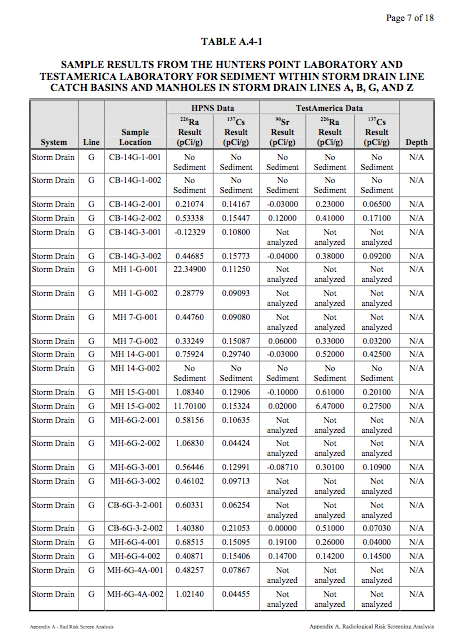 He asked if people would feel more comfortable if site-specific sampling was conducted at the breaks and data were collected that would enhance confidence in the risk level. Mr. Elias raised the issue of tarry refinery waste at AP, where it was left in place and the risk is low, but decision-makers have to manage the waste and the risk and communicate this to the public. This may be a messy issue long term. “Mr. Norman said CERCLA is driven primarily by long-term human-health risk and the City may not be required to comply with long-term maintenance or handling in the event of a calamity. Dr. Russell said this is not true; the City will have to conduct routine maintenance, and emergency maintenance if needed, and will require funding for long-term rad maintenance. State and community acceptance of risk are also considered. “Ms. Ott said EBMUD may not be comfortable working near the rad-impacted industrial waste lines. Mr. Chesnutt asked if new soil samples collected showed higher risk, would rad workers have to be hired and, if this happens, are people at risk. Mr. Robinson said no. Mr. Terry said the data from along the trench line show the risk is trivial. Mr. Carr said the highest levels detected now are about 30 pCi/g, and what is not known is what criteria other agencies (e.g, California Occupational Safety and Health) have for restricting access to this area. Mr. Terry said he did not know but it would likely depend upon the volume at 30 pCi/g. “There was a question about whether the sediment is still present in the manholes. Mary Parker (Navy) said sediment was not removed from the industrial waste line manholes except for the small volume of sediment required for the laboratory analysis. Mr. Robinson said sediment in the manholes could be removed fairly easily and would help reduce the volume of soil. “Mr. McGinnis said when risk was evaluated, the highest risk scenario was to an industrial worker at 225 days per year, 8 hours a day, for 25 years, through direct contact with soil. For the emergency worker the exposure and risk would be significantly less. Mr. Robinson said the Navy will evaluate the information provided today more thoroughly. He asked Mr. Obertello if EBMUD was asked about routing around the existing industrial waste lines. Mr. Obertello said EBMUD is looking to upsize the lines in this corridor because of fire flow pressures. Ms. Ott said sewer and storm drain lines are planned for this area. It is not realistic to expect EBMUD to work around existing rad-impacted lines. “Mr. Norman said the Navy is taking the actions it needs to take and cannot take response actions to enhance development. He understands the City will have to maintain the existing lines and this could be more costly or more risky. Further, replacement of existing lines could cost more if the Navy abandons the lines with residual rad in place. “Mr. Chesnutt said he is not sure it is a protectiveness issue. Ms. Ott asked if the risk is negligible, would a rad contractor be needed. Mr. Robinson said from a risk perspective, no rad contractor is needed. Ms. Ott asked if RASO concurred. Matt Slack (RASO) said he believed a rad contractor would be needed, but he agreed with the existing data and that the risk due to the sediment within the pipe is minimal. “Mr. Terry said when something is left behind, there will always be a question whenever a hole needs to be dug in the street. Time and resources will be needed to respond to questions. “Mr. Elias said the Navy usually looks at source control through removal, and that ICs are for residual contamination. Now, ICs are being looked at for source material and felt this is an unusual way of managing a contaminant source. Mr. Chesnutt said he was not sure this was a source area or just material left behind. Mr. Elias suggested the rad might be a de minimis source. “Mr. Robinson asked if there are ARARs that address waste left in place with low risk. Ms. Toth said with ICs in place the area cannot be used as residential, and ICs are required if something is left in place. Mr. McGinnis said residential risk was evaluated and there is no exposure pathway for residential users. The middle of Building 5, in the mezzanine area, is where radium-226 luminescent paint was applied to aircraft dials and other devices from 1941 to the mid 1950s. The Navy plans to begin removing the radium contamination from the mezzanine area in December of 2012 or January of 2013. The harmful health effects of radium were not understood in the mid-20th century. In fact, just the opposite was the case. Hundreds of products were marketed that touted the health benefits of radium, including skin creams, bath salts, and even “growth-inducing” plant fertilizers. It’s no wonder that paint waste was dumped down storm drains in those days. That’s what happened in Building 5. It ended up in storm drains leading to the Seaplane Lagoon and the lagoon itself. By 2010 the Navy had either removed or cleaned the drains leading to the lagoon. By spring of 2012, the dredging of the Seaplane Lagoon was completed. There remain only three areas of concern for radium contamination at Building 5 – the mezzanine painting area, some storm sewer lines under the ground floor slab, and the old industrial waste line under West Tower Ave. The Navy’s recently-proposed plan for leaving radium contaminated drain lines in place has been criticized by the city and the Restoration Advisory Board for being inadequate. Plans for removing radium paint stains from floors, walls, and ceiling areas have received little public attention, however. Radiological scanning equipment being used in another building at Alameda Point. The photos that accompany the Navy’s scanning survey say more about the obsolete condition of the mezzanine area than they do about radium. Most of the contaminated areas are small patches, which are marked by spray paint and photo outlines. Class 1 surveys covered 100 percent of floors and walls up to six feet. Class 2 surveys covered 50% of areas above six feet. Floors and walls were scanned with a cart-mounted device designed to eliminate human variations in scanning distances. Hard to reach areas were scanned with handheld devices. Areas that were scanned included the paint shops, instrument shops, pathways from the instrument shops to the first floor staging areas, as well as buffer areas around those rooms and the ventilation system. Radium 226 poses a health risk when ingested. The radiation is relatively low, but since the distance to cells within the body is effectively zero, the impact is high. And it’s effects are relentless, since it is not easily expelled from the body. The mezzanine area is in the area also known as the Breezeway, which runs east to west between the two hangar areas of Building 5. Hopefully this lead paint contaminated architectural oddity will be torn down so that we can more readily attract businesses here and to the surrounding areas. It has an easily identifiable wooden wall on the western side, marking it as one of Alameda Point’s most prominent eyesores. In the mid 1950s, the radium paint operation was moved across West Tower Avenue to Building 400. This building will undergo radioactive paint remediation at the same time as Building 5. Click on any photo below to enlarge and play slideshow. Photo sampling of survey areas within Building 5. Scanning equipment being used in other buildings at Alameda Point. Marking chalk lines on floor for scanner to follow. 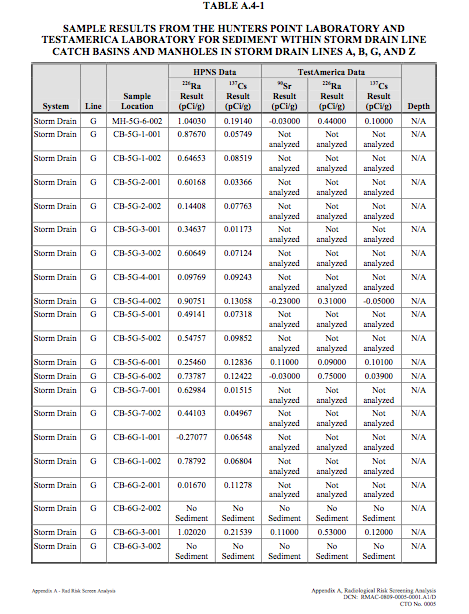 Digitized image of normal background radiation. The scanner looks for “hot spots” that exceed background. All photos are Navy photos, except for exterior photo of Building 5 Breezeway. Related story published on the Alameda Patch. The past year had some high points and low points in the cleanup process at Alameda Point. Added delays, including a pile-driving surprise, were balanced out by steady progress. The year saw, among other things, completion of a second Point-wide radiological survey of buildings and structures that identified two building interiors needing radium remediation, a new soil scan for radium on a section of the western runway area, replacement of a storm drain segment next to the Seaplane Lagoon, and preparation of the environmental document for the Berkeley Lab site, which will be useful whether we get the Lab or not. The contractor preparing to cover the old dump with rocks and soil at the northwest tip of Alameda Point delivered some embarrassing news to the Navy. In the normal course of their duties, work-plan design testing revealed that the shape of part of the contamination did not match the official description. You would think they could just process a work-order change. But the Superfund law requires an additional two-year review process, which will push the completion of this open space opportunity to 2015. At another cleanup project, the Navy drove over four dozen 30-foot steel electrodes into the ground to heat up the toxins and capture the vapor. But before turning on the electricity, the contractor discovered they had hit a sewer line. The project has since been idle for months awaiting a decision on how to proceed. The big Seaplane Lagoon dredging project that began in January is certainly one of the most dramatic displays of cleanup. Both the northeast and northwest corners of the lagoon were supposed to have been dredged by April and final soil disposal completed by year’s end. But the contractor failed to meet the deadline and was let go. A new contractor has been testing and removing existing soil, as well as doing extensive set-up over the past two months for the dredging of the northwest corner that will begin in January. Another dredging project has just begun under the dock area next to the maritime ships. They’re removing mud contaminated from two storm drain lines. That project is on schedule. It’s worth visiting the area to get a glimpse of the elaborate engineering needed to capture and clean water runoff from the mud. Less dramatic and seldom seen work is always ongoing. Groundwater is monitored at cleanup sites to ensure cleanup goals are being met. One example is the monitoring of the removal of benzene and naphthalene under Shinsei Gardens and vicinity. Evidence of the Petroleum Program is also seldom seen, other than some white PVC pipes in the ground. But besides the big fuel extraction projects, there is ongoing testing of pipelines and oil/water separators in order to develop a remedial plan. Finally, and perhaps most important, getting the first, very large, no-cost land conveyance from the Navy next year appears to be on schedule. To help make it happen, the Navy and regulators are planning on modifying cleanup goals by enacting restrictions against future ground-floor residential development near the east entrance to Alameda Point. Originally published in the Alameda Journal. Building 5. W. Tower Ave. is on right. Up until passage of the Clean Water Act in 1972, it was common practice to dispose of chemicals by dumping them down sewer and storm drain lines that drained into the nearest surface water. Many people did this in their homes. At Alameda’s former Naval Air Station the worst legacy of this practice was in the drain lines leading out of the massive Building 5 and nearby Building 400. Building 5 is where the radioactive paint with radium-226 was used to paint aircraft dials and markers. Radium-contaminated storm drain removal - 2010. Drains deposited in hazardous waste trailers. of thousands of feet of the most seriously contaminated lines leading to the Seaplane Lagoon. But questions remained for Restoration Advisory Board (RAB) members about drain lines leading north to the Oakland Estuary and also the Industrial Waste Line that was installed after passage of the Clean Water Act. The RAB heard a presentation at the September meeting about the Navy’s recent examination of all the remaining drain lines using cameras and sampling equipment. The drain lines lead out of Building 5 and are part of the cleanup area known as Operating Unit-2C. Three of the storm drains and the industrial waste line were found to have areas of elevated radium, although nothing close to the levels found in the lagoon drains that were removed last year. Six alternatives for dealing with the problem, from no action to complete removal ($58 million), were presented. Two hundred ninety-seven samples were collected. Industrial Waste Line Should Not Be Left in Place – The majority of the RAB favored the option that prescribed hydro-jet cleaning, limited excavation and disposal of storm drain lines, and complete removal of the Industrial Waste Line. Concern was raised about two alternatives that allowed the Industrial Waste Line to remain in place under West Tower Ave, the main thoroughfare between the hangars, and have so-called institutional controls. Institutional controls can have a way of being forgotten as the decades roll on, which could lead to workers being being exposed to radium during infrastructure upgrades. The forgotten lines could also lead to unexpected expenses for the city and to the posting of alarming radiation warning signs long after everyone thought the problem had been dealt with. Update – October 13 – Another reason to remove the old Industrial Waste Line: The August 8, 2011 Navy feasibility report cited in this post stated, “The industrial waste line is not considered a candidate for hydro-jetting due to the deteriorated condition of the line.” Better to remove it than have toxic residue leaking out into the water table. RAB co-chair Dale Smith said it was premature to vote on alternatives. The regulatory agencies still have to review the report. Nuclear Fallout Residue Also Surveyed – The Navy’s contractor also gathered data on the presence of Cesium-137 and Strontium-90. 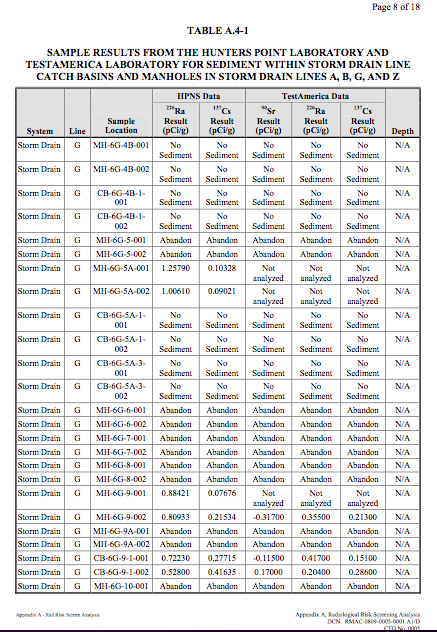 The presence of these two radioactive isotopes in drain lines was expected due to worldwide data showing that nuclear weapons testing and nuclear accidents such as Chernobyl have caused widespread dispersal. 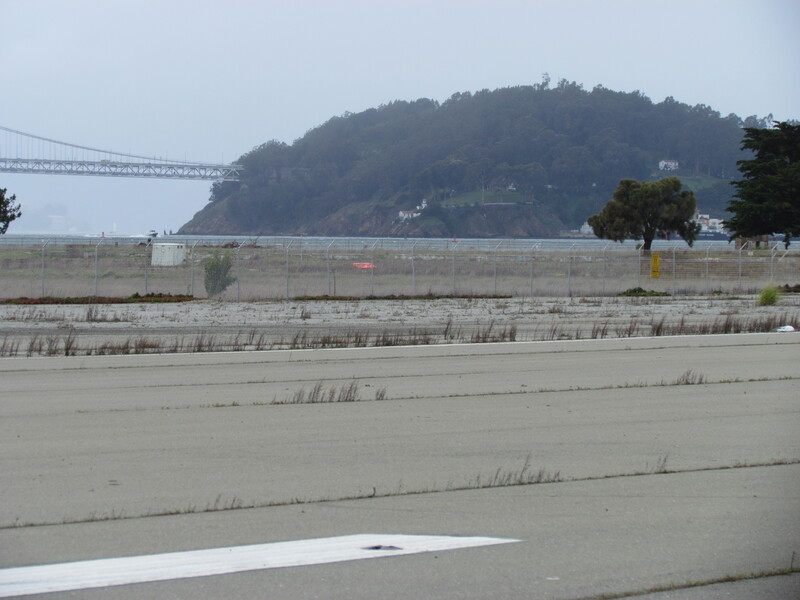 There are also records indicating that some observation planes that flew through nuclear fallout during nuclear weapons testing were dismantled and decontaminated at Alameda Point as part of the weapons testing studies. The main reason for concentrations in drain lines at Alameda Point is because of all the concrete pavement that sends high volumes of water runoff into drains. 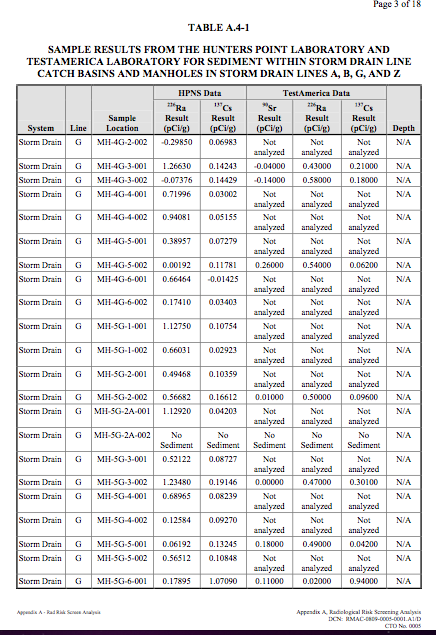 The levels of Cesium and Strontium concentrations in the investigative samples were within the range that could be expected from worldwide fallout of nuclear weapons testing. 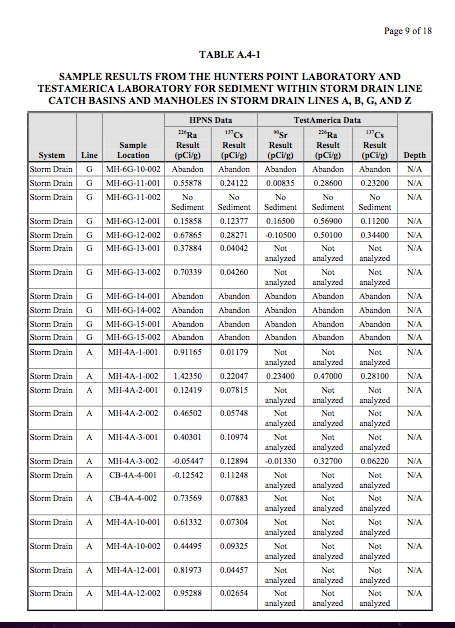 Updated October 12, 2011, in response to inquiry from reader – Below is a map and nine pages of test results for Storm Drain Line G, which partly runs along Pan Am Way. Also indicated is the Main Trunk of this storm drain, which runs from Building 5 on the left of the map to the Seaplane Lagoon on the lower part. The three horizontal storm drain lines shown below the Main Trunk are called laterals. 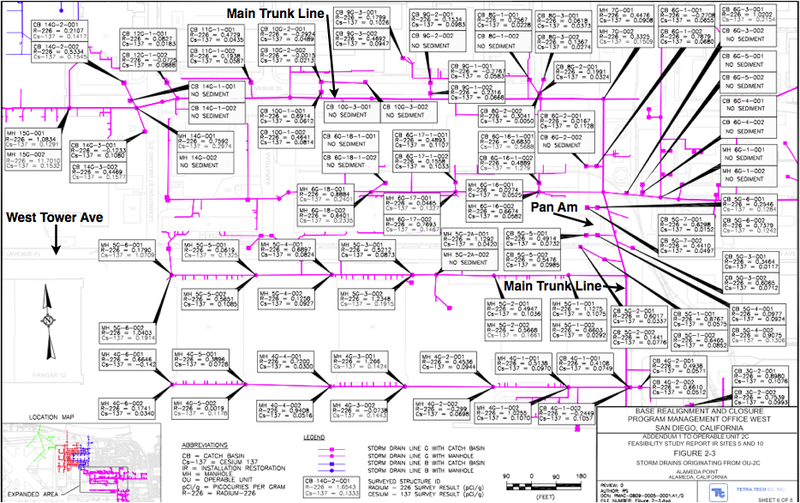 Only the Main Trunk portion is singled out for remediation work. The likely alternative that will be chosen will not be complete removal. Instead, it will (hopefully) be limited removal and replacement in the few areas that show elevated readings for radium. One alternative is to not do anything, but rather leave the lines in place with “Institutional Controls,” which means a big hassle if anyone ever wants to do infrastructure work. The remediation goal for radium 226 is nothing greater than 1.56 pico curies per liter. It’s based on a background level of 0.56 that would be randomly found in Alameda. This background standard was established by agreement between the Navy and US EPA in prior years. 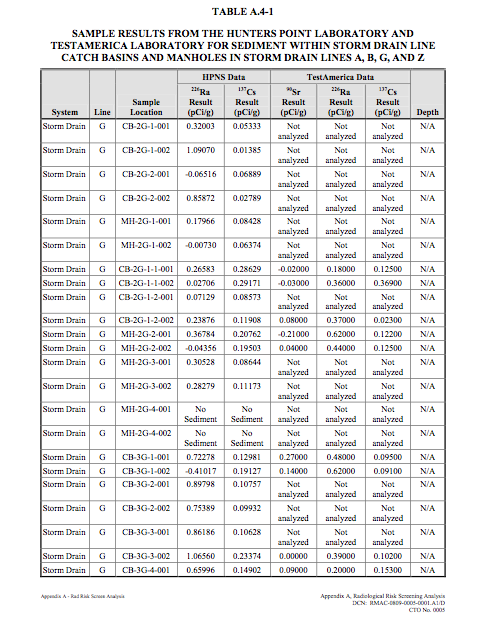 The remediation goal set by the Navy is nothing in excess of 1.0 above background, or 1.56. The Navy’s “1-above-background” standard is more stringent than the norm for US EPA. In looking at the readings in the boxes and on the test result tables, there are only a few locations where radium was found to be a problem. 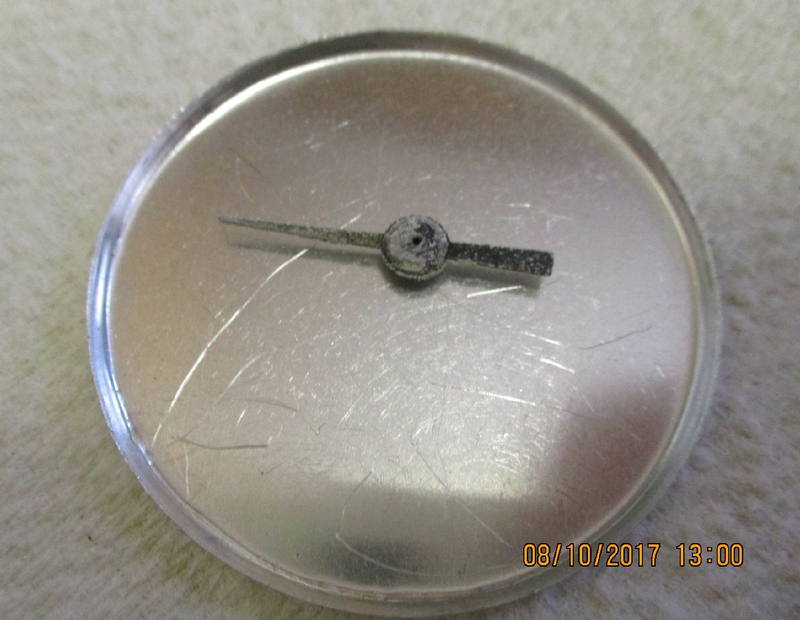 “MH” in the box means it is manhole that was tested. “CB” is a catch basin. One reason for the low readings could be because in 2009/10 when the most seriously contaminated lines – F and FF – were being replaced due to radium contamination, the Navy had Storm Drain Line G power flushed to clean it out. The contaminated water was properly disposed of. Another possible reason for the low radium readings is that the point from which it leaves Building 5 (where the radium paint was once used) could have been the least used for disposing of radium paint waste. This would correspond with the actual results of testing before and after the recent dredging operation on the northeast corner of the Seaplane Lagoon where line G ends. Other than a few solid objects containing radium, none of the dredged material from the northeast corner required disposal at a nuclear waste facility. The upcoming dredging of the northwest corner, however, will likely yield elevated radium in dredged sediment.